As a college student, I’ve gotten used to living frugally (as I type this on my MacBook and listen to music on my Bose speakers). In the past 4 years at Berkeley, I have used toilet paper for towels (and vice versa), stolen umbrellas/water bottles/writing utensils from classrooms after everyone leaves, feigned interest in a club to get a free dinner, and even slept a couple hours early when I ran out of groceries so I wouldn’t feel the pangs of hunger. But, I say to you, no more! 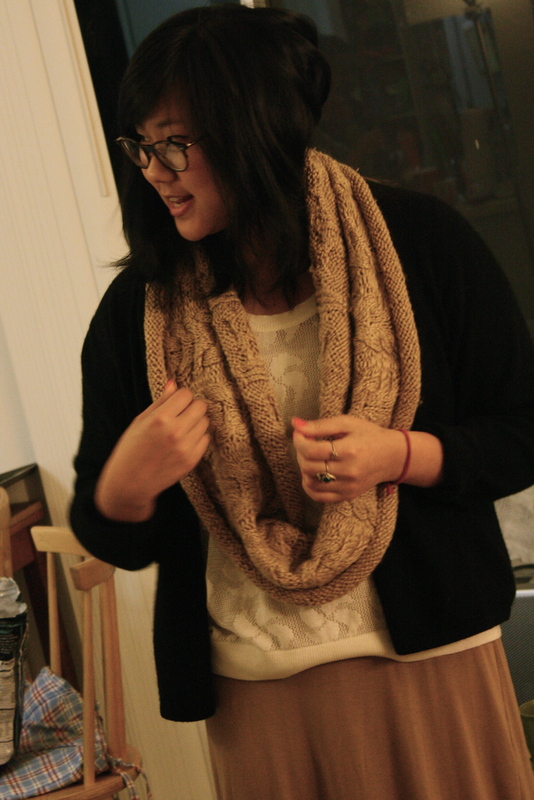 I have found a way to live in luxury as well as pay off some of those college tuitions: Knit! 1. This is a new cable stitch that I googled up. It’s called the horseshoe cable and it’s really easy to do! However, it does look a bit protuberant before blocking, so be prepared for that. 2. 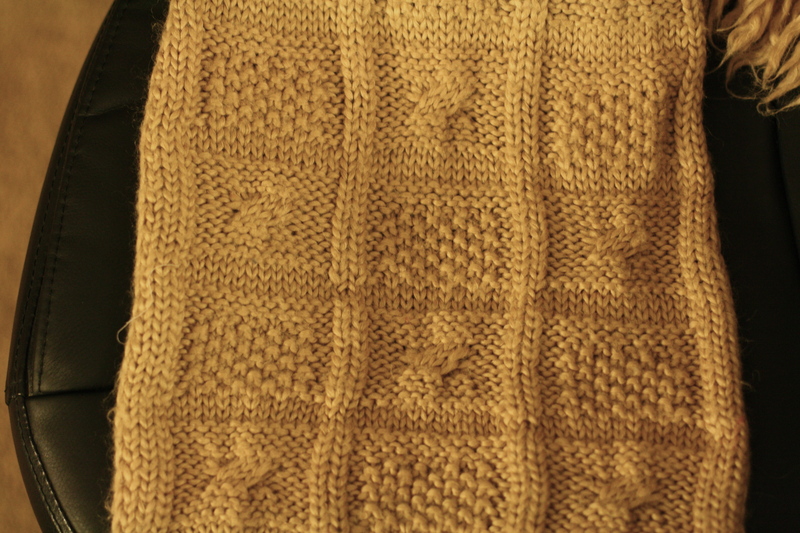 My primary inspiration was the Nordstrom’s Chunky Cabled Infinity scarf, but I could only see so much detail from zooming in on the picture, so I took some liberty in how the cabling was done. 3. 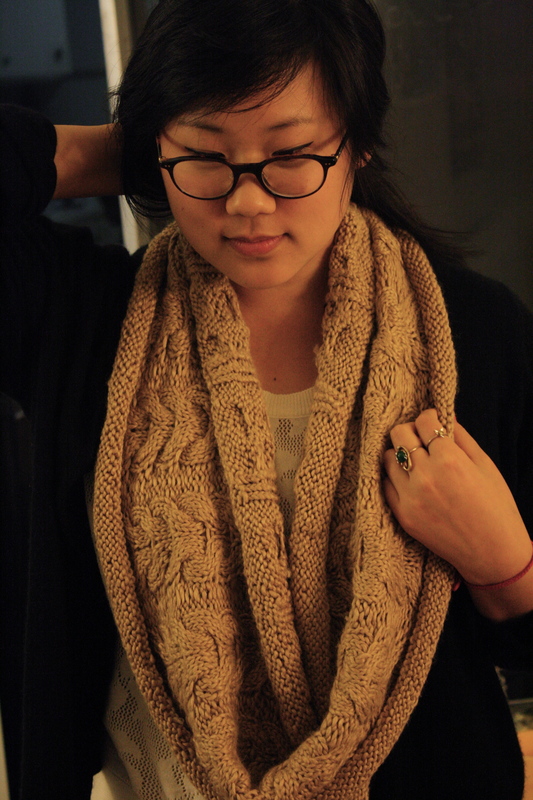 In fact, this scarf is so easy that I’ll give you the pattern right here: CO 195. Work 2 inches in st st. Work horseshoe cable 7 times. Work 2 inches in st st. Cast off. Block. Wear. The girl wearing the scarf is Irene. Thank you, Irene. 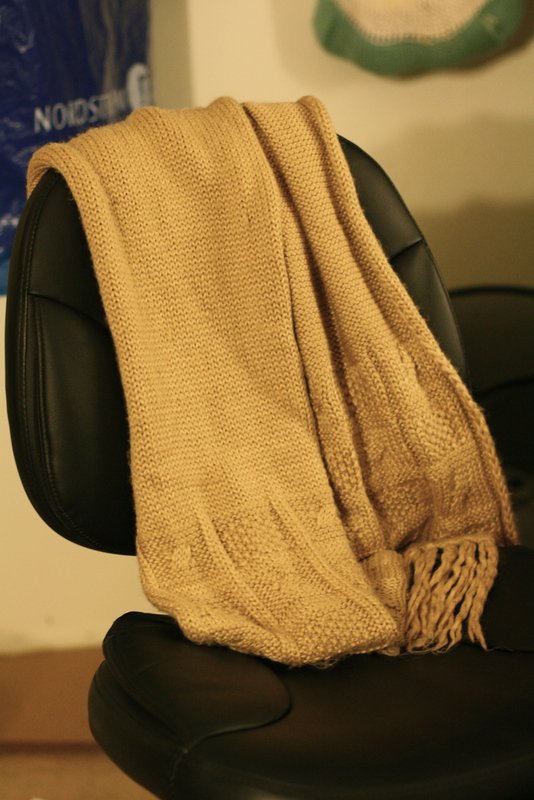 I know it looks like a pretty standard scarf, but the ends had this weird pattern that looked really bad, in my opinion. – Soft yarn like wool will usually get stuck to other strands. All you can do is just pull really hard and break some fibers. 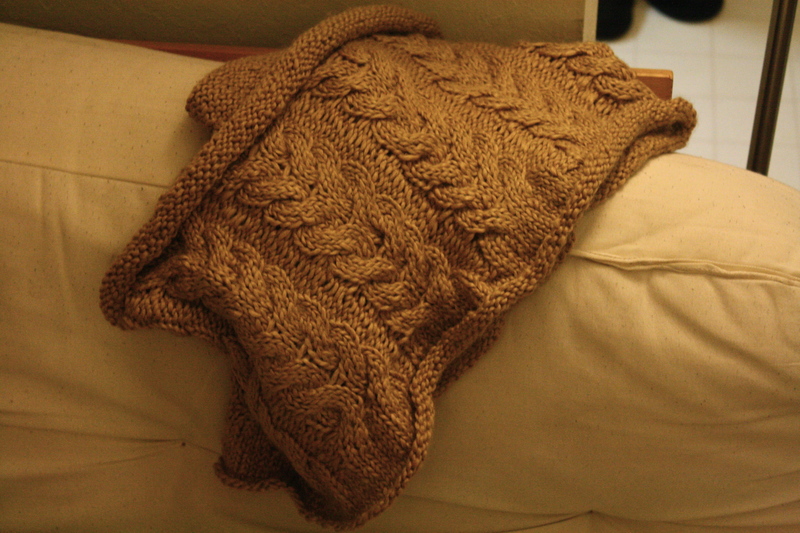 -If you reknit the yarn with needles of a different size than used for the original project, the stitches will look kind of warped, but this should be taken out when you block the piece, so no worries. When I first realized this ingenius way of getting cheap yarn, my mind was blown. I currently have a large white blanket and grossly ugly purple sweater awaiting their demise on my shelf. 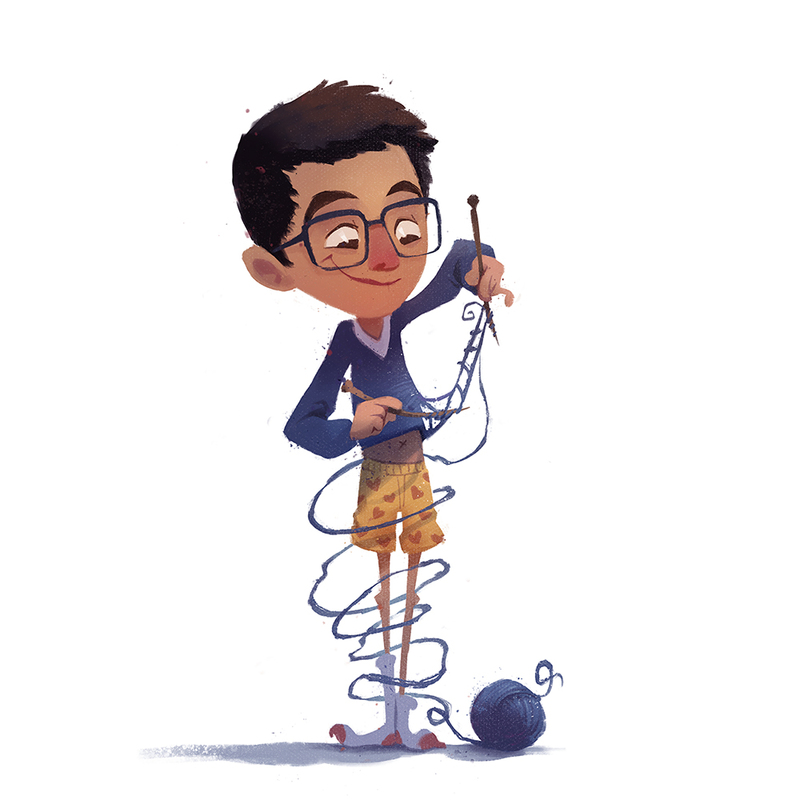 Also, I look around during class and see what articles of clothing people are wearing that I could use for good yarn. I see so much potential. So now, I call all of you to scour your closet for that hideous sweater you got for Christmas 3 years ago or that regretful impulse buy that you have yet to wear and give them to me. Give me your tired(-of-looking-at sweaters), your poor (ugly cardigans), Your huddled masses (of yarn) yearning to breathe free. The wretched refuse of your teeming shore (I mean closet). Send these, the homeless (failed knit socks that no longer reside in your sock drawer), tempest-tost to me, I lift my lamp beside the golden door (#204)! ***The MR5 Committee is currently revising the MCAT for the 5th time since 1928. The proposed revisions would include a behavioral/social science section and remove the writing sample. If approved, these revisions will be introduced in the 2015 MCAT. your circle scarf is a neck brace !! !